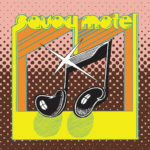 The star-spangled funk of analog Nashville quartet Savoy Motel deserves to resound like sunshine shat from transistor radios the world over. Replete with an unrepentant guitar solo, new single “Sorry People” is a thrift store find twenty years ahead of its time. Composed of players Jeffrey Novak (Cheap Time), Mimi Galbierz and Jessica McFarland (both of Heavy Cream) and Dillon Watson (D. Watusi), Savoy Motel will release its self-titled debut LP on 21 October. Watch the satin and straw-laden video for “Sorry People” below and pre-order Savoy Motel on vinyl via What’s Your Rupture? Records.